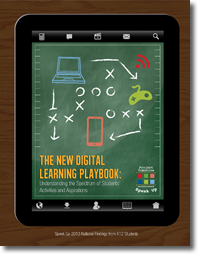 The New Digital Learning Playbook: Understanding the Spectrum of Students’ Activities and Aspirations is the first in a two part series to document the key national findings from Speak Up 2013. For the past eleven years, Project Tomorrow’s® annual Speak Up National Research Project has provided schools and districts nationwide and throughout the globe with new insights into how today’s students want to leverage digital tools for learning based upon the authentic, unfiltered ideas of students themselves. With this year’s national report on the views of 325,279 K-12 students representing over 9,000 schools and 2,700 districts nationwide, we focus on getting beyond the anecdotally- driven stereotypes of student technology use to establish a more comprehensive understanding of the myriad of different ways that students are currently personalizing learning using technology. How are K-12 students currently using digital tools and resources to support schoolwork activities? How are K-12 students currently using digital tools and resources to enable out of school time learning activities? 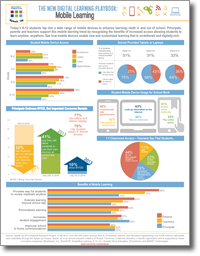 What are K-12 students’ aspirations for using digital tools and resources within new innovative learning environments? If you think this data is interesting and would like to gain a better understanding about your stakeholders’ perspectives about the use of technology for learning, participate in Speak Up 2014. The online surveys will be open Oct 6 – Dec 19, 2014 and survey results will be available in Feb 2015.